If you need a good look at a few heads of cattle, you may want to get a look at chairman’s new promotional video. “Yeah Yeah Yeah” is not 100% beef, but the girls of chairmans do a great job of cheering for the cows and even performing wotagei for the livestock. At this point, I would probably talk at some length about the “Yeah Yeah Yeah” ‘s uptempo guitar riff arrangement, but I think the sight of four girls in coveralls performing kecha for bovine. Give the song a listen: it’s an enjoyable listen, and the Iwate girls group would like you to love them as much as they love the local cow population. 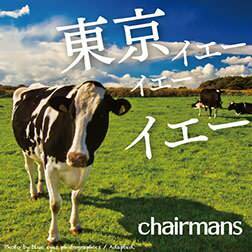 Buy chairmans’s “Tokyo Yeah Yeah Yeah“!